Elkhart Windows knows how much your home means to you. Which is why they put their absolute best into absolutely everything they do. In essence, your home means as much to them as their home's do. By treating your home and it's needed with care, you know that they will do their utmost to make sure that whatever the window project at hand is, it will be completed with incredible care, perfection, and professionalism. When it comes to installing a bow window, there is care and precision that goes into every step. Unlike a bay window that sits "flat" against a home, a bow window curves out. Making it the perfect place to install a window seat or a little kitchen nook. In fact, the definition of a"bow window" is a "curved bay window." Instead of having seams coming to a "point" or "peak", these windows are curved to offer a sleeker aesthetic. Because of its curved construction, it will need a professional install, not to mention larger paned windows can be a little tricky to test out a DIY on. This is why Elkhart Windows offers professional and experienced install staff ready to help with any project you need. Not to mention they will also go over a cost assessment with you, in order to be able to keep track of the cost of the project and what will need to be accounted for. Because these windows are more of an intricate install, it is always nice to know that the experienced staff at Elkhart Windows will be taking care of everything. Another thing to consider when looking into window repair or replacement is the cost. At Elkhart Windows, they want to be sure that you have everything you need before you begin the big project. By going over the cost of the project with you, you will be able to prepare for everything and avoid the surprises that a do it yourself project can bring. 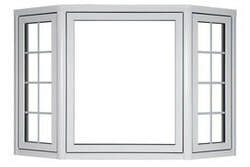 Additionally, the also offer windows from Home Depot and Lowes in order to keep things readily at hand. Which means that in the case of an emergency repair, there will be no need for boarded up windows for weeks at a time, as the materials are close by. It may seem as though going through a professional company can be time and money consuming. But there are certain projects that really are not designed to be a do it yourself. Or to even hire the 'kid from down the street.' Though it is great to help the "new guy in the biz", it is also important to remember that project involving large panes of glass can be delicate work. Meaning, when you choose a professional company to do any kind of renovation or replacement, that company will also come with their own set of insurance, a warranty, and skilled help. Things like insurance may not seem important on the outset, but if a storm were to all of a sudden destroy materials, or the glass were to fracture in transit (because in rare cases accidents happen), you could rest easy because Elkhart Windows is behind you all the way, and will make sure - no matter what - your renovation finishes without a hitch.